In his accompanying essay to the exhibition Collage —Divided Legacies, the Bangladeshi writer and academic S. Manzoorul Islam explains how during the 1950s and 60s, the eastern and western wings of the new nation of Pakistan interacted extensively in the area of painting and visual arts, forging a shared tradition. Unfortunately for Pakistan, this was a rare meeting of its geographically and culturally disparate wings— the contradictions caught up with it in 1971 and the birth of Bangladesh was followed by a decade-long hiatus in artistic exchange. It wasn’t until the early 1980s, when Dhaka began organising the Asian Art Biennale, that links were renewed. Since then, Pakistani artists, both established and new, have been showing their works in Bangladesh and vice versa, and the artistic fraternities in both countries have kept abreast of the trends and developments in the two countries. Featured with a clutch of lesser known artists, are Eqbal Mehdi from Karachi (born in Amroha, UP), who died just two months ago, and the Bangladeshi master Shahabuddin Ahmed. Besides his paintings, Mehdi is known for his pen ink sketches of women in contemporary attire as well as traditional finery, such as the one on display here. 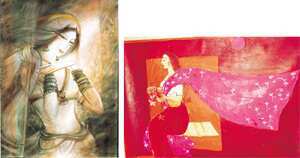 Priced mostly between Rs80,000 and Rs1.5 lakh, other works include eight oil on canvas paintings by Tassaduq Sohail, whose work was auctioned for £15,000 at Bonhams in Dubai last month, and five works by A.Q. Arif, who is known for his abstract architectural landscapes inspired by Mughal architecture. Also on display are works by Mashkoor Raza—his calligraphic work can be found at the Victoria and Albert Museum in London—featuring his trademark motifs of horses, women and the sun. “These artists are well-known within their countries," says Jain. “But we want to facilitate and bring to art lovers here a chance to see and critique them." She met Jami in Shanghai four years ago, discovered a common passion for art and joined forces to set up Art Asia, an online art gallery. Jain says that art from India’s two smaller neighbours has never received the kind of support and patronage that NRIs and Indian corporate entities have given artists here, and she and her partner want to provide an international platform to the younger and less well-known South Asian artists. Artists in both countries tend to depict social realities, feels Jain because both are still nations in transition. She also points out that Pakistani art is more evolved than Bangladeshi, which still tends to be more abstract, a lingering legacy of figurative art being traditionally looked upon as un-Islamic. However, the trend is changing, with young artists there moving towards figuration. The semi-abstract painting of Buddhist monks by Kanak Chakma and Jamal Ahmed’s more classically modern fisherwoman by the seashore bear out Islam’s contention that Bangladeshi artists have embraced modernism but always retained a “local perspective". “Today, art in these countries is where Indian art was 15-20 years ago," says Jain. “Now is the time to buy." Collage—Divided Legacies will be on view at Galerie Romain Rolland, 72, Lodhi Estate, New Delhi, until 5 November.